Mass Relevance is a firm that helps brands curate social media content and display it on TV and on screens out of home. Mass Relevance recently committed to displaying strictly Twitter content on major network broadcasts, a deal that speaks to the social media rivalry for control of the TV. “We built Mass Relevance to connect relevant conversations from social networks and fuse them into a customer's brand story,” CEO Sam Decker said in a press release today. The companies shared an investor in Austin Ventures. 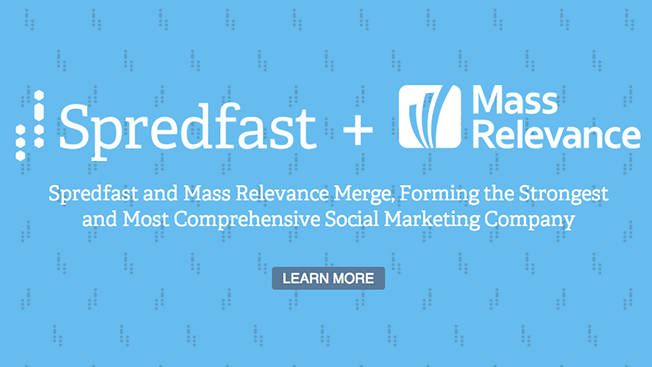 The merged company will retain the Spredfast name. The social media management space has been in consolidation mode with firms uniting to offer all the monitoring, activity and data needs in one place for advertisers. In another example, Sprinklr bought Dachis Group earlier this year. Last month, Google shut down Wildfire, a social management platform that left a number of brands looking for new partners to help store troves of consumer data, which they harvest during digital marketing campaigns. Brands increasingly need to take control of their social channels, which are ever changing and sometimes throwing up challenges, such as Facebook’s evolving News Feed, which now limits the spread of unpaid messages. The social media technology companies help brands manage the data about fans and followers in ways that make advertisers less beholden to a single channel to reach consumers. Spredfast and Mass Relevance have worked with brands, including AT&T, Target, Whole Foods, Pepsi, GE, Campbell’s, Warner Bros. and Walgreens.